11 We don't think the university should be an Ivory Tower -- even if this were possible. The university should serve society, should open itself to action. As it is now the university does have a political position. It serves an elite class (.05% of the population) which owns and controls most (about 70%) of this country's wealth and property, and which exploits working people here and overseas. What do we mean? ( Where does this figure come from?) Besides teaching students a general ideology which keeps the ruling class in power, it sets as an instrument of this class in many direct ways. The most obvious is the University ROTC program. ROTC is essential (not so) to our military adventures, as the director of Harvard ROTC points out "Today, reliance upon colleges and universities is greater than ever, For example, the 1968 graduating classes contained over 11,000 newly commissioned officers who .... will fill 85% of the required annual input needed to provide the junior leaders for todays troop units." Through it's ROTC and military recruiting programs, the university performs an indispensable function for American forces needed to protect the U.S. corporate rulers encroachments on foreign peoples. To this the president of U. of Iowa says "the university is neutral toward the matter of which recruiters will be allowed on campus." 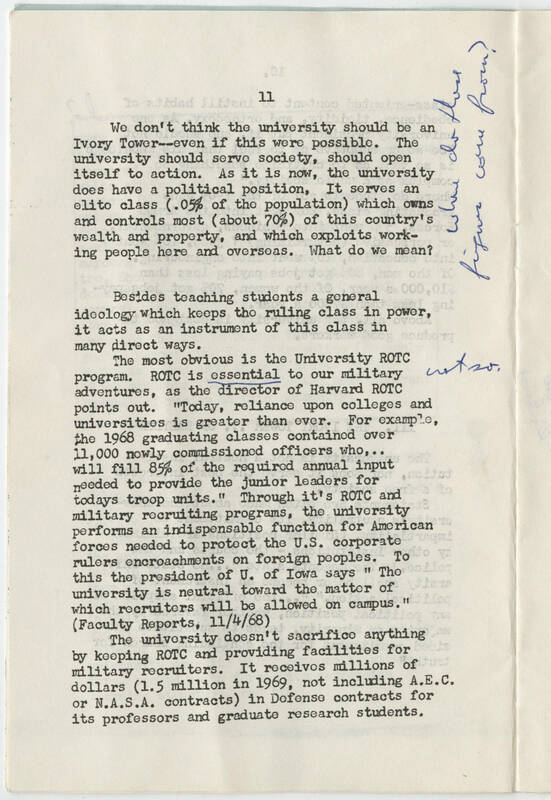 (Faculty Reports 11/4/68) The university doesn't sacrifice anything by keeping ROTC and providing facilities for military recruiters. It receives millions of dollars (1.5 million in 1969, not including A.E.C or N.A.S.A contracts) in Defense contracts for its professors and graduate research students.